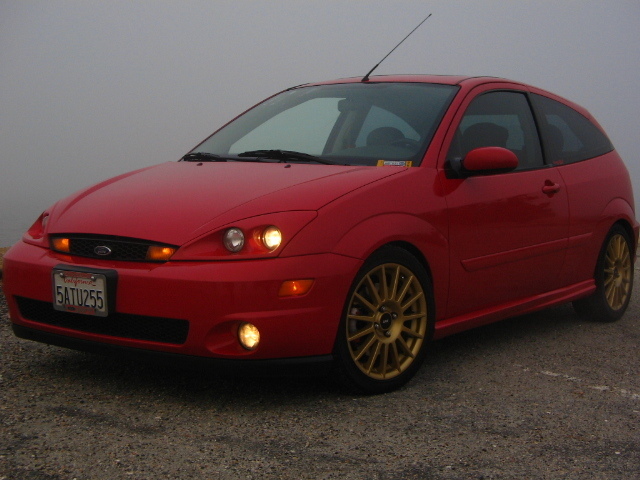 2002 Ford Focus ZX3 SVT | "Midas"
I had noticed that every modification I was making to P1 was to make a little more like an SVT. Also at all of the local focus meets, the SVT guys always seemed like the cool guys and segregated themselves from the standard foci. I wanted in! Just a little more than ea year after purchasing P1, I traded it in for this new 2002 Ford Focus SVT. I was finally one of the cool guys! I had purchased the car literally 3 days before leaving for bootcamp. All I had was a few printed photos of the car to keep with me in my “A&B Locker” while in basic training, but it was enough for me to stay excited and motivated throughout those grueling months. I would show off the photos to anyone and everyone that would look. It was my pride and joy, and I couldn’t wait to drive it. While in bootcamp, I found another ‘focaljetter’ that had an SVT! It was sonic blue and would drive down the main road every Sunday on my way to the chapel. Unfortunately he was base staff which meant he couldn’t really chat with a lowly recruit. I still managed to finagle my way to him in an open setting to chat SVTF with him. After graduation from Navy basic training in Great Lakes, IL, I was immediately transferred to Little Creek Amphibious Base in Virginia Beach, VA. I found out the day I arrived that my class wouldn’t start for another month so I applied for leave to pick up my car and drive it across-country. I then had 48 hours to get a flight to San Diego from Virginia Beach, Fly home, say Hi to family for the first time in months, load up the car and drive 3000 miles back to Virginia Beach. I did it. It hurt, but I did it. On the upside, the SVT got a proper break in while driving it 3000 miles in cruise control with a full load. For the next three years, the car gained e-fame within the focus community with its gold EAP’s and being the first mk1 to do a mk1.5 swap. The intention was to install an SAP front bumper, but it never came to reality before trading in the car for a vehicle that I thought was a good idea….a 2007 Chevy Silverado. Oops.